Stefan posing with a very tolerant Laotian family in the capital city of Laos: Vientiane. 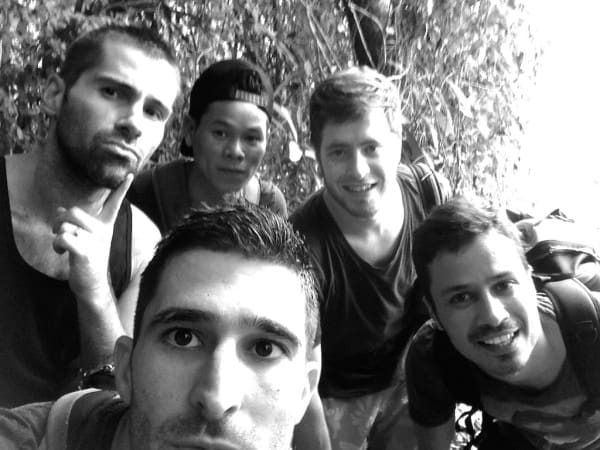 This article was written by Stefan and Sebastien and first appeared on their Nomadic Boys gay travel blog. 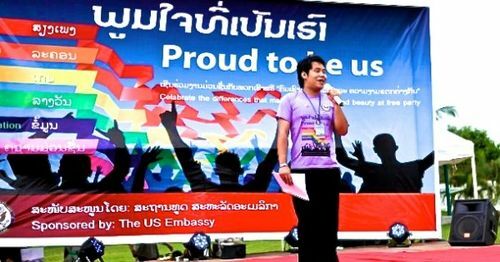 Laos has a mixed attitude toward gay people. It appears to be another Asian country struggling hard to accept and protect its LGBT population. There are no anti discrimination laws in place and marriage equality is nowhere near being implemented. Yet, there are no laws criminalizing homosexuality and haven’t really ever been since independence. 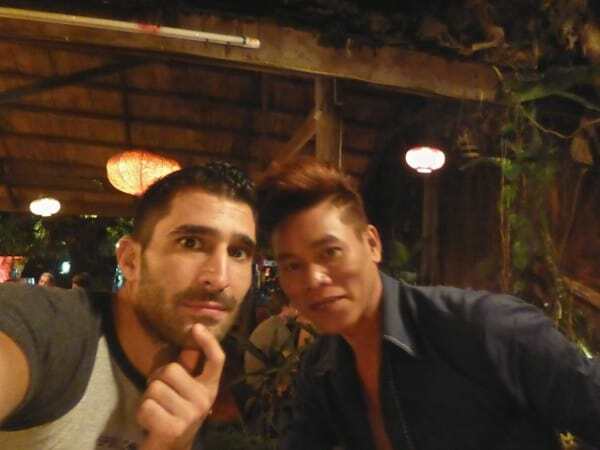 We felt completely at ease traveling as a gay couple in Laos: locals just didn’t bat an eyelid when they worked out we are not really brothers. We also noticed a very accepting attitude towards ladyboys (just like in Thailand), more so than in the West. 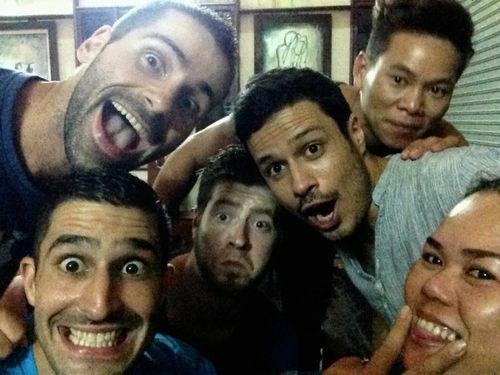 We met a local gay man named Somphorn, who gave us some insight into what it’s like growing up gay in Laos. Somphorn telling us about gay Laos and what it was like growing up in Luang Prabang. Sabaidi Somphorn! Where are you from and what do you do? Bonjour Les Nomadic Boys. My name is Somphorn Boupha. I am 28 years old and I am from Luang Prabang in North Laos. 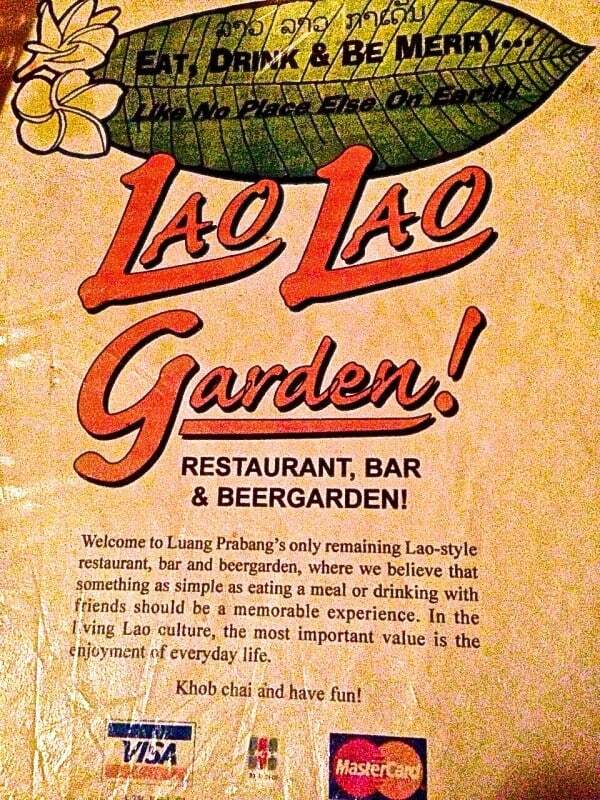 I own and manage Lao Lao Garden in Luang Prabang, which is a gay-friendly bar and restaurant. Are you out to your friends and family? Yes, all my family and friends know I’m gay. I came out to my family when I was around 20 years old. My mother said she always suspected I was different and was very accepting, as were all my siblings. I lost my father from a young age so I never really knew him. What’s it like growing up as a gay boy in Laos? I was really lucky to have a very accepting family and group of friends, which made it easy. However, there were no gay places so it was hard to meet other guys. Now the social media apps have made this a lot easier. It can be problematic though for some to gain employment in government or other high status sectors if they are openly gay as there are no anti discrimination laws. Discretion is therefore important. Everyone around me knows I’m gay, but as long as I don’t shout out loud about it, then everything is fine. 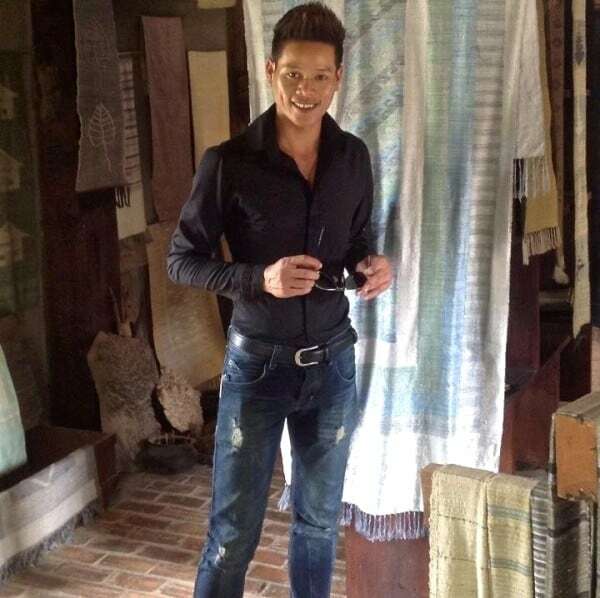 Are there any places in Luang Prabang you recommend going out for gay tourists? There are quite a few gay-owned bars in Luang Prabang but Lao Lao Garden is the most well known because of various references to it in online gay resources like Utopia. We have gay staff and attract a mixed crowd of both local and western gays each evening. In Laos it is illegal to market my bar as gay or put a rainbow flag outside. If I did, then this would attract negative attention from the police and Lao Lao Garden would be closed down. Our group selfie with Somphorn at the Kiuang Si Falls in Luang Prabang. Are there any gay friendly hotels you recommend to LGBT tourists? There is a lovely resort called Belmond La Residence Phou Vao, a bit outside town, which is very welcoming and has very excellent reviews. I use the gym at the Le Sen Boutique Hotel, which is more central. Both of these hotels have pools as well. A more budget option is the Singharat Guest House where you boys stayed. Somphorn posing at home in Luang Prabang. Where can LGBT tourists meet gay Laotians? Grindr and Hornet are a good starting point. In Luang Prabang, we obviously attract a large LGBT crowd here at Lao Lao Garden. 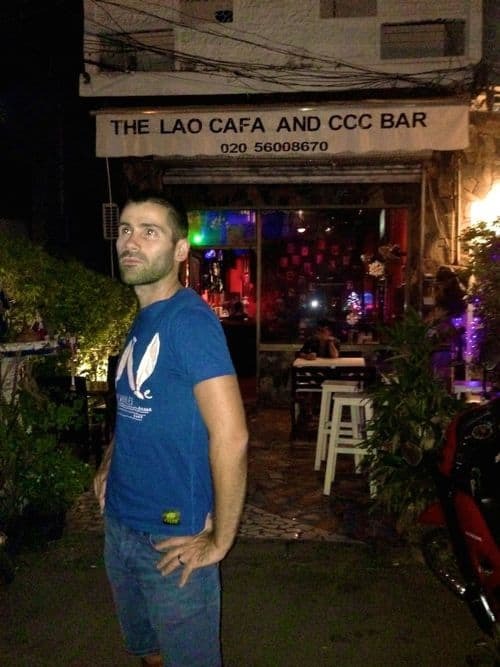 In Vientiane there is a bar called CCC Café, which is also unofficially a ‘gay bar’. Seb posing at the CCC gay bar in Vientiane. How do you deal with the midnight curfew? The curfew in Laos technically requires everyone to be home by midnight. But this is not actually enforced. The police are not going to stop you if you are outdoors after midnight! But for businesses, we are required to close by midnight. In Luang Prabang this is more strictly enforced in order to protect and preserve its UNESCO status. Some business outside the center of Luang Prabang pay bribes to the police to allow them to stay open beyond the midnight curfew. 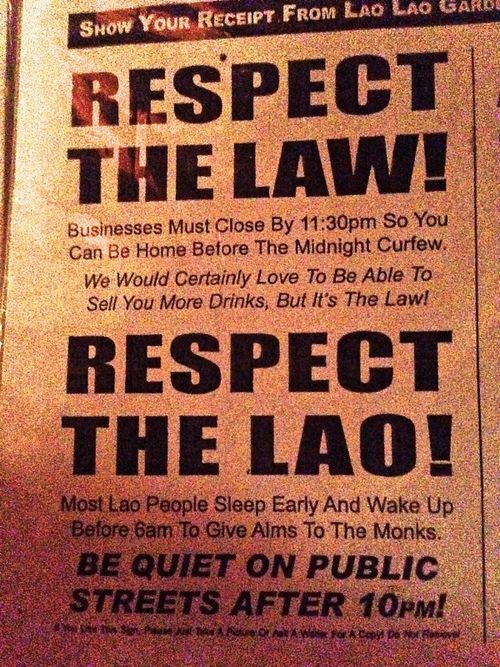 The midnight curfew in Laos is more strictly enforced in Luang Prabang. 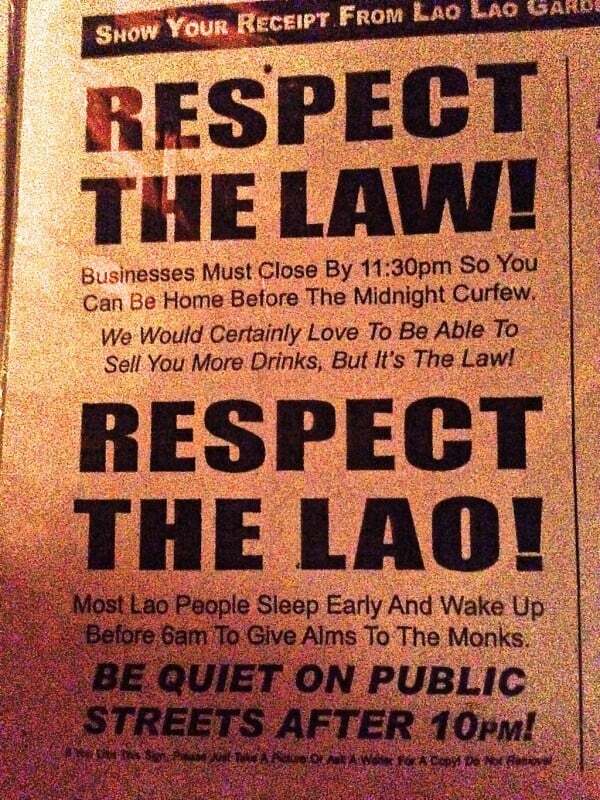 So where’s good to hangout in Luang Prabang after curfew? There is a popular bowling alley a short tuk tuk ride away from the center open till 2am and a few local bars but this changes daily. A night out in some of the local bars in Luang Prabang with Somphorn. Are there any gay events in Laos? We had our first Pride on 25th June 2012 and again on 17 May 2013 called Proud To Be Us. It is hosted by the US Embassy and held on their sports field in Vientiane. There haven’t been any more announced yet, but you can join the Gay In Laos closed Facebook or Like the Gay Life in Laos page for more information. Laos Pride at the US Embassy in Vientiane. Watch our travel video of our month in Laos.